Before September this year I didn’t know what my physical limits were when considering my career as an artist. Since the beginning I have adopted a somewhat cavalier ‘I’ll get things done at all costs’ attitude that, by and large, has paid off, seeing me secure opportunities that I may have missed had I been more conservative. 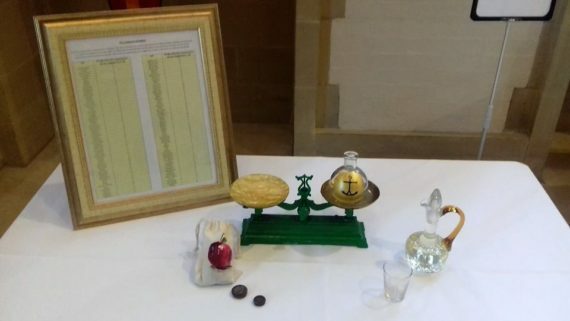 However, the events between September and November – which involved a residency, a solo show, 5 workshops and 2 group exhibitions – serve to highlight the physical stresses placed upon my position as a fine art perfumer. Moreover, it highlighted individual physical nuances between the various activities I undertake. Suffice to say, it’s been a rather exhausting couple of months but, more pertinently, I feel as though the quality of a few of my activities have been compromised due to me overestimating my physical capabilities. Therefore I believe it’s important to document and assess each activity from a physical standpoint as more considered approach to taking work on will result in a better quality, more coherent output in the future. 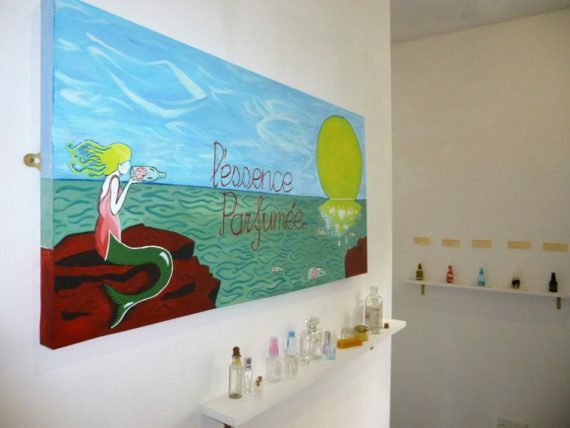 My residency and solo show chiefly involved making perfume portraits. This doesn’t require much physical activity as a large chunk of the process involves thinking about what fragrances to combine. This can be taxing mentally, for sure, but it doesn’t exert much physical stress. 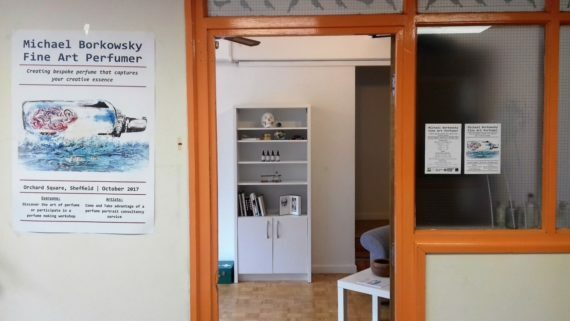 That said, the act of being present within a space 4 days a week for 4 weeks, on top of other commitments, meant that my residency – while by no means exhausting – was physically tiring. My solo show too, which included making large scale paintings as well as perfumes, and lugging them over to Nottingham and back by hand, took its toll. Yet these two activities were both prioritised due to them being large, solo endeavours that are important to my career progression. As such, their quality wasn’t compromised and I doubt I’d do much differently. A bit of physical exertion never hurt anyone, after all! However, two group exhibitions were also nestled in between my solo activities. These were more strenuous an undertaking as I prioritised my solo activities above them. As such, it emerged that I didn’t really have the time and resources to commit a great deal of time producing work for them. 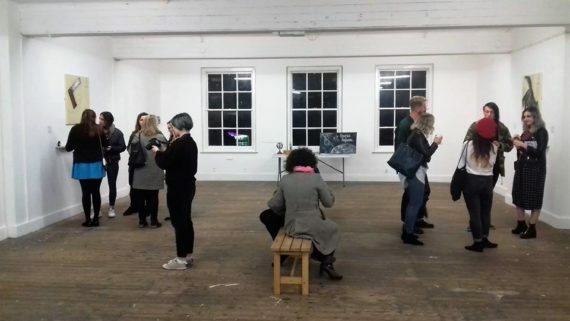 This is partly due to my ethos when it comes to group exhibitions, which sees me want to push and extend by body of work beyond its preconceptions; to try something new and experiment. While my solo shows are defined by ‘perfume portraiture’ I can play loose-and-fast with group shows – creating fresh and unexpected work. But it turns out that this approach has its own set of drawbacks when placed around other activities. Perhaps then, over the last two months, I reached a point where I shouldn’t have tried to make new work for one of the two group shows. Re-showing old work to a new audience would have been the appropriate thing to do as so not to compromise the quality of the work I made for my two group shows while still pushing the possibilities of fragrance to new audiences. An interesting thing to note is the nature of my workshops, which are more of a physical – and more performative – than I’d realised. Perhaps I use performance to mask the vulnerabilities that come with teaching perfumery without being a perfumer. While I am always clear that I am approaching perfumery from a fine art context I still want to impart correct knowledge when it comes to fragrance design and creation, but I think a bit of performance helps reinforce my fine art background. So on reflection, what would I do differently? Well I’d probably not commit to making new work for one of the group shows. That’s about it really. This may seem like a rather frivolous conclusion, but the truth is that generally speaking I have loved the last few months. I love the process of making fragrances and the challenge of making something new and unexpected. I love to push my solo shows beyond their preconceptions and I love travelling around the country teaching the art of perfumery. And long may it continue. It’s just useful to know what your limits are so that you can build high quality and deeply engaging activities around them. 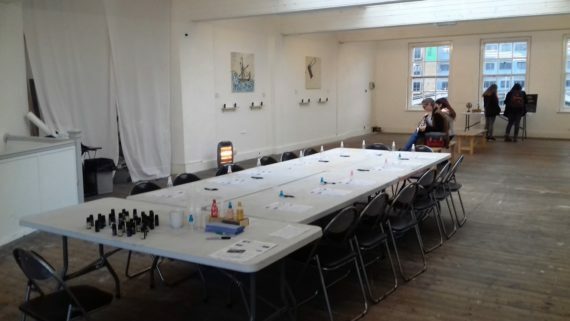 So a funny thing happened to me the other day, when I was at Surface Gallery, in my exhibition space, preparing for my perfume making workshop (which went brilliantly, by the way.) I chanced upon two visitors to my exhibition drawing my work: Looking intently at the paintings I created to accompany the perfumes, then drawing them and making annotated notes. This post is not so much about the drawings themselves, but how the situation made me feel. Although honestly I didn’t give it much thought in the immediate aftermath as I was busy preparing my workshop. But having had time to reflect it was actually a somewhat heartening experience. I feel it somehow legitimises my creative output as bearing witness to such a direct consideration of my work revealed its affecting qualities, and how it can be utilised for learning. It also reminded me of school, when our art classes often consisted of having to sketch paintings created by real artists in order to learn the basics. I suppose the roles are now reversed to an extent. Yet despite being very much a professional artist, that feeling of being a ‘real artist’ still eludes me. Maybe it always will, maybe it’s the same for everyone, or maybe experiences such as this count towards achieving such a feeling. Either way I feel humbled and happy about the whole thing. 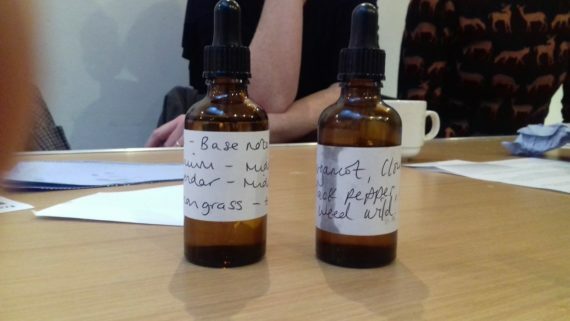 Perfume as Practice continues at Surface Gallery, Nottingham until Saturday 18th November. Last Friday saw the opening of Perfume as Practice AW17 – my solo show at Surface Gallery, Nottingham, which houses 20 perfume portraits and a series of paintings. The perfumes have been achieved through a process that begins by asking artists the question ‘why do you make art?’ The response received goes through an established method of intuition, interpretation and investigation, allowing me to combine relevant and meaningful fragrance oils that capture the essence of each individual artist. The perfumes and paintings correspond to each other, and have been developed under the overarching theme of ‘Constellations.’ I theme my perfume shows as a means of aping fashion industry standards of bringing out seasonal themed collections. I chose ‘Constellations’ as a theme because I believe there are parallels to astronomy and fragrance; both of them possess a degree of intangibility that isn’t fully understood. We can’t fully contemplate how our nose reads scent and we can’t fully contemplate our position within the universe, so I theorised that if we placed both notions together we may be able to develop a more considered and more personal understanding of both. Placing astronomy within the context of fragrance allows you to contemplate it from a more personal and domestic standpoint, while placing fragrance within the context of astronomy reveals it’s endless possibilities. Furthermore, each fragrance has been placed under a painted representation of a constellation. There are five in total, each symbolising certain behaviours, desires and principles and that drive creative endeavour. The aim was to reveal connections between sets of artists and uncover different modes of creative desires. That was the initial idea anyway. And it’s an idea which seems to have engaged the local audience; the exhibition has been very well received. It’s interesting to showing my work to an unacquainted audience with no preconceptions of me, and their response feels rather heartening, reinforcing my position as an artist using scent as a viable means of communication. Perfume as Practice AW17 is showing at Surface Gallery until 18th November.